I recently read an online article from a well-known “Manners Guru” about how brides to be should accept “Mom’s” old wedding ring as her own. 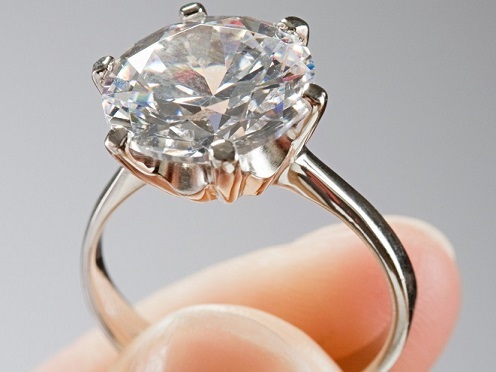 The "Manners Guru" basically suggested that the young bride should just “grin and bear it” and accept his Mom’s old wedding ring for his future fiancés engagement ring. You don’t want to hurt his or the family’s feelings?" Sure this ring represents some sentiment for the groom and his Mom. However, it could also represent a failed marriage. That’s right; didn’t I mention that the future Mom-in-law and Dad-in-law were no longer married? What kind of sentiment is that? However, the “Manners Guru” eluded to the idea that "the ring was special as it was gifted in a marriage that ultimately produced the young bride’s future fiancé." Isn’t that special? What next, his Mom’s old wedding dress? I don’t think so! While the ring in question was previously given to Mom in-law as an engagement ring, it was NOT given as a birthing gift as a result of her newly born son. I am sure the son came years afterwards. So, I don’t really think that sentiment holds water. The bottom line is, the ring involved Mom and Dad, not the Son and his future Fiancé. Now I know the “Manners Guru” is trying to spare the feelings of the son and his family. What about the feelings of the bride to be? She has feelings too you know! Does she have to accept a “family heirloom” that will be a potential reminder of a failed marriage? Now come on, admit it, you know that’s the way others may see it, including the bride to be. Nevertheless, I would have chosen another course of action. Newlyweds-to-be do not need additional complications as they cultivate their new life together. Life is hard enough as it is, especially in these economic times. Life will throw them plenty of other curve balls to try and juggle. Of course this now means her fiancé will have to go to the expense of purchasing a new engagement ring. And that’s okay. Let him spend a few dollars, it doesn’t have to cost him a mint. After all, over the years she will surely earn it. Well, that’s my two cents. What do you think girls? Feel free to email us at info@villarrealjewelers.com.